The pyramid-cultures all built “Triptych” three-door temples, with the door in the middle wider and taller than the two flanking it. 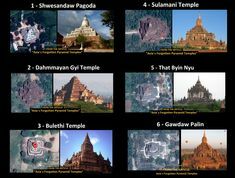 As we can see, the facade of each temple has the same unmistakable three-door pattern. 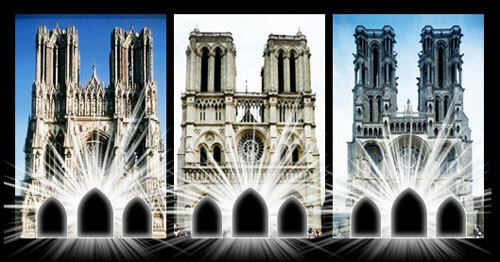 Astonishingly, the universality of this architectural phenomenon has yet to be noted by archaeologists, and as such I have chosen the term “Triptych” to describe it, due to its similarity to the Triptychs painted by many Renaissance painters (many of whom, we shall find later, were aware of these Triptychs and their meaning). 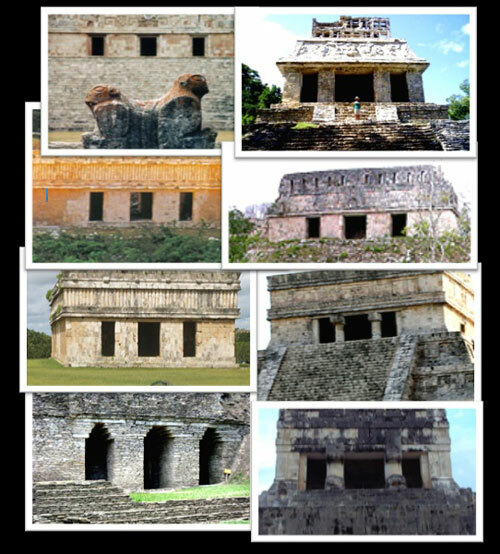 Eight Mayan Triptych temples from various cities in the Yucatan Peninsula. The abundant occurrence of the Triptych across the ancient world is not a random coincidence. The Triptych represents more than merely an architectural element; the Triptych is the chief symbol of an advanced Universal Religion that was once shared globally in Antiquity, mainly by the pyramid cultures. The discovery of the Triptych provides, for the first time, conclusive evidence that ancient cultures worldwide shared the same spiritual beliefs. It also indicates that these cultures did not evolve independently, but were probably descended from the same more remote parent source. 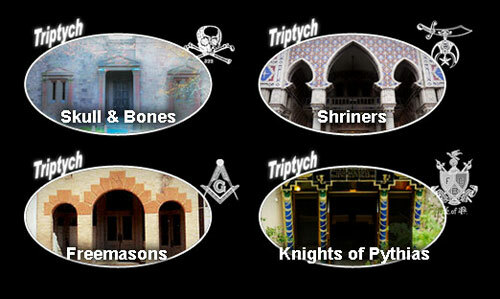 The Triptych pattern is visible on the facades of the most famous Secret Society headquarters. The Universal Religion shared by the ancients and hidden in these Secret Society Triptychs is a complex and detailed spiritual belief system. Its tenets have been known throughout recent history by philosophers, poets, theologians, astronomers, alchemists and occultist—all of whom have been initiated into its wisdom. The problem is, we have amnesia of our immortal godhood Self (capital S) because it is covered up by our mortal animal bodily self (lowercase s) while we live our lives on earth. By following a careful set of instructions—encoded in the Triptych—we can transcend our body and see our real god Self within. This has long been the goal of alchemists, occultists, spiritualists and philosophers, and it is achieved by an age-old spiritual practice known as “Awakening Our Third Eye,” with the Third Eye being a vestigial organ of spiritual illumination that lies hidden in the human forehead. Whereas the two eyes see outward at material things, the single Third Eye sees inward at the inner soul. 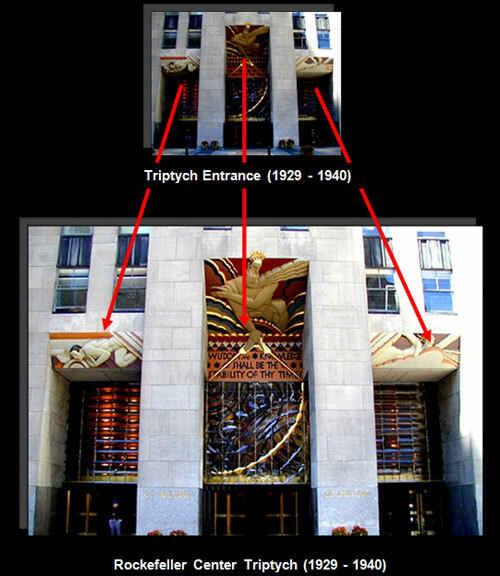 Left: Triptych entrance with luminous Third Eye above the center door, The Museum of Television & Radio in New York City. Right: Triptych pattern with Third Eye above the center door on a dome of a key building of the Bronx Zoo in New York City. 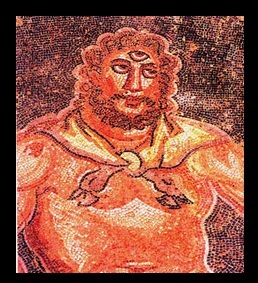 The Third Eye is well-known in esoteric circles and has been variously described throughout history as the “Divine Eye,” “All Seeing Eye,” “Mind’s Eye,” “Eye of the Soul,” and “Inner Eye.” While the name for it differs, what remains constant throughout the esoteric doctrines is that the Third Eye is not a metaphor, symbol, or analogy. It is affirmed to be a real, physical part of the body able to strengthen or atrophy as much as any other muscle; by exercising it, one slowly but steadily increases their awareness of their natural spiritual powers. Single “Eye” and “Third Eye” portraits stretch back thousands of years and appear again and again in myths, sculptures, engravings, and paintings in ancient pre-Christian cultures across the world. In fact, the further back in time we look, the more we see the Third Eye in art, architecture, literature and poetry. “The Eye of the soul, which is blinded and buried by other studies, is alone naturally adapted to be resuscitated and excited by the mathematical disciplines. The Third Eye is symbolized in Eastern spiritual systems by the single dot on the forehead. Third Degree Tracing Board in Freemasonry. 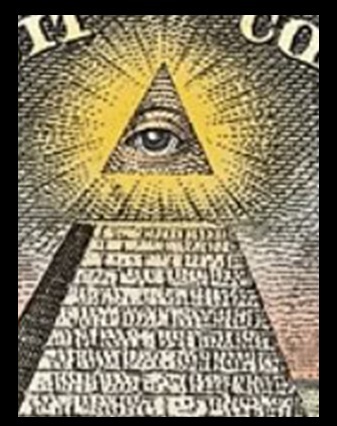 Freemasons today—who no longer understand their Order’s Third Eye secret, it having been “lost” in the mid 1800s, as we shall see—refer to this single Eye as the “All Seeing Eye” of God, which God they believe is the Hebrew Yahweh of the Bible. But a vast amount of evidence proves that the “Eye of God” is not the symbol’s authentic and original meaning; instead the All Seeing Eye signifies the Third Eye hidden in the human forehead. 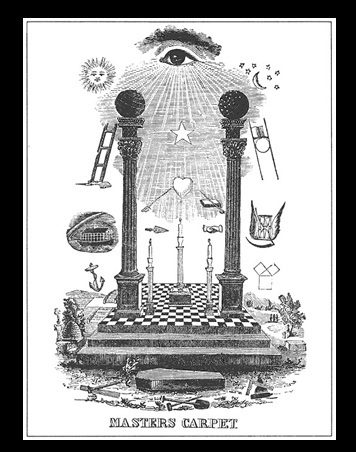 The Tracing Board shown above, as well as the entire system of Freemasonry, was designed to teach initiates how to awaken it. Here’s how it works: Our bodies are perfectly symmetrical from side-to-side, made of two equal and opposing halves—a right-side half and a left-side half. We all have two hands, two arms, two legs, two hands, two feet, two shoulders, two eyes, two ears, and so on. 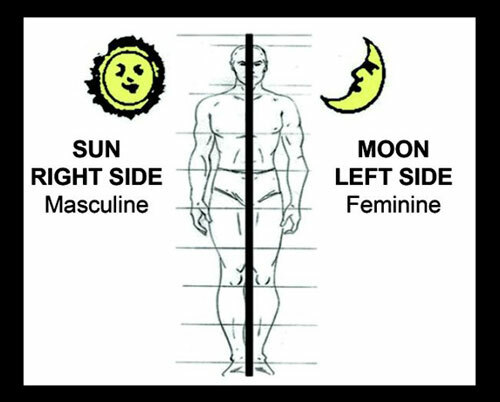 According to the Universal Religion of the ancients, our right-side half is solar (and male) and our left-side half is lunar (and female). Left: So-called “Christian Androgynes” showing a male holding the sun at right and female holding the moon at left, 17th & 18th centuries. Right: An engraving from Michael Maier’s alchemical text, Atalanta fugiens, 1618, showing a male with solar head on right and female with lunar head at left. This duality of opposites present in the human body is actually a microcosm of the duality of opposites present in the entire universe. The sun and moon, for example, are perfect opposites. The SUN stands for DAY—the MOON stands for NIGHT. In the DAY it’s HOT and LIGHT—at NIGHT it’s COLD and DARK. In the DAY things are DRY—at NIGHT things are MOIST. The HOT DAY means LIFE or GOOD. The COLD NIGHT means DEATH or EVIL. The sun and the moon are simply one of the most prominent examples, and this “pairs of opposites” wisdom forms the “lost key” to all the Mystery school teachings in history. Because man lives inside the universe and not apart from it, we too are composed of these same pairs of opposites—“as above, so below,” says the famous Emerald Tablet. The key is not just to understand this sun/moon duality of the human body. The key is to “unify” or “balance” the twin opposing sides and thus “transcend” the bodily duality. It’s precisely the Third Eye’s awakening. Western mystics symbolized this additional concept for centuries by drawing an eye inside the Triangle, that symbol of the awakened Mind’s Eye. 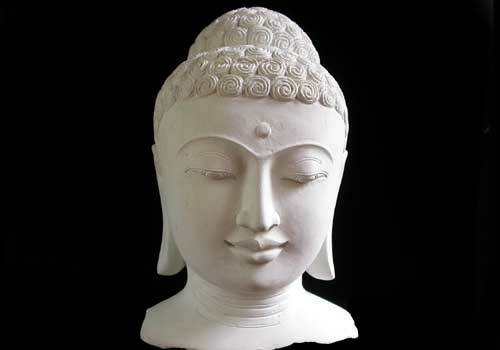 Whereas the two eyes see outward at material things, the single Eye sees inward at the spiritual soul. 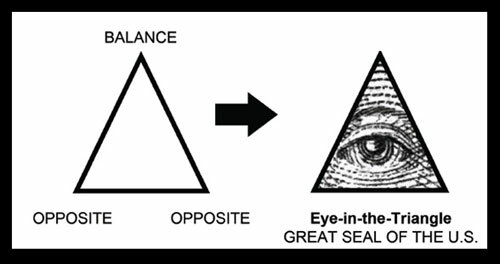 The Great Seal of the United States depicts the Third Eye in a triangle at the pyramid’s unfinished apex. Did the Founding Fathers know, through their affiliation with Freemasonry, that the world’s ancient pyramid cultures all practiced the Third Eye religion? Masonic regalia. The Third Eye symbol is always placed in the middle, balanced between sun and moon. Masonic Temple, Newfoundland and Labrador. Note the single Eye inside the middle triangle. Male on the right, female on the left. The god in the center door of the Triptych is you, your inner Self. Note the Masonic compass in the god’s hands. Thus, according to the Universal Religion of the Triptych, we humans are inherently divine, but in some sense we have fallen from our heavenly home into a human form. The divine soul still exists within us—indeed, it is our true Self according to the Universal Religion—and through the use of the Third Eye we can reawaken our inner godhood. This is a gross oversimplification of the religion, but I cannot do it justice in such a short piece: more information and a thorough reconstruction and explanation of this religion is present in my book, Written In Stone, which also includes research related to the religion, including its origins and presences across the globe. Remnants of the Universal Religion survive best in the East, predictably, where many of its tenets can still be seen to play a part in Eastern spiritualism. The Third Eye still exists in—and is indeed still a major part of—the Hindu religion, for example, though distorted by the passing of time. The Universal Religion, however, fared far worse in the West, where the rise of Christianity led to direct conflict with the idea of personal godhood. This “missing history of the Triptych” in the West seems to be precisely the message that great artists like Leonardo da Vinci intended to convey esoterically in portraits like The Last Supper, which show how Jesus (i.e., the religion of Christianity) has “covered over” the Triptych religion of ages past. 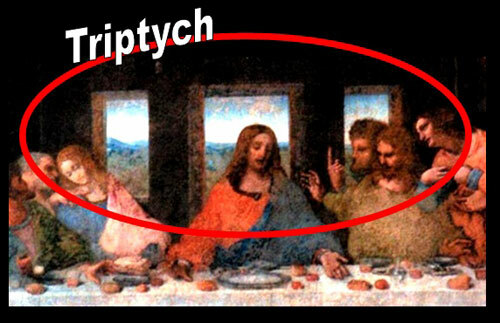 Was da Vinci telling us in code that Jesus’ religion has covered up the ancient Universal Religion of the Triptych? Or is he saying that Jesus the “man” found his “god” (Christos) within by using the Triptych religion? Or is it both? The reasons and interplay that influence the conflict between the ancient Universal Religion and the early Church are myriad and out of the scope of this article; suffice it to say that the ancient Universal Religion was perceived as blasphemous in the Catholic church, and it was for this very reason that the Church stamped out this religion—or at least tried to. Though they all but exterminated practitioners of the Universal Religion, like the Druids, there were people who remembered the Universal Religion and banded together to protect it, forming mystery cults that passed this knowledge on from generation to generation, which became Secret Societies that we hear about today. Strong words, and odd, considering the Masons were employed by the Church to create the great Gothic cathedrals in the first place. What secret did the Church discover about the Masons? What secret could be so important as to make the Church turn completely around and attempt to extinguish the Order? It must also have been, then, a secret of great import: one worth risking life and limb to preserve. One, perhaps, concerning a greater power: that of the soul and its possible ascension. 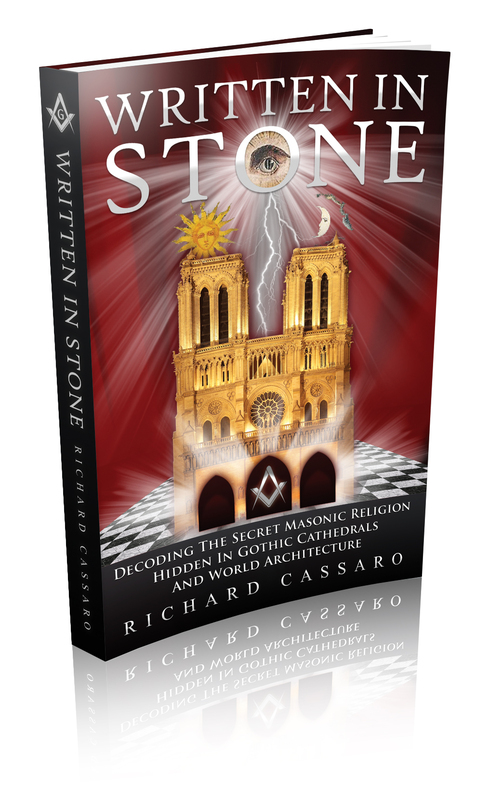 In Written In Stone, attention is focused on the so-called Notre Dame cathedrals designed and erected by operative Freemasons in Northern France during the medieval Gothic era. Built a thousand years ago, these stunning stone skyscrapers still leave scholars puzzled as to the methods behind their construction. The Masonic builders seem to have had a sense of secret empowerment that they crafted into the cathedral, using their secrets of design to create a monument capable of uplifting others. Left to Right: Reims, Notre Dame, Laon. Gothic cathedrals in France. This Western facade is in essence a giant hieroglyph in stone. It was designed by the Freemasons to reveal the ancient Universal Religion of the Triptych, which we see at the base of each building. Follow the twin towers downward. You’ll notice that each tower ends in its own doorway on the ground; these two doorways, the “doors of opposites,” form the outer two doors of the Triptych. 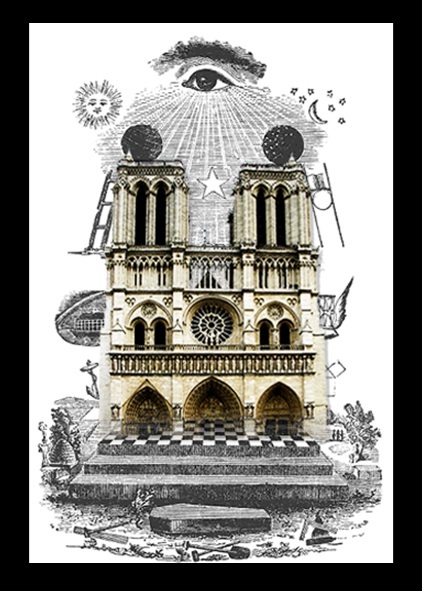 Aesthetically, the taller and wider middle door emphasizes the higher spiritual center of man between the lower duality of his physical body—the Masonic idea of the Triangle written in architectonic form, in the very stone of the cathedral itself. A circular “rose window” sits directly above the Triptych’s center doorway, marking the middle entry. It symbolizes the true Self—the light of the soul or god within. The cathedral facades are the piece that finishes the puzzle. It fits the criteria of the Secret: a secret that was both dangerous to the Church and worth the very lives of the Masons. It also explains the Church’s abrupt turnaround: the Church realized what the Masons were doing, but they couldn’t very well order the destruction of these grand cathedrals. They instead issued a decree to try and stamp out the Masons, limiting the damage to their hegemony and ensuring that no one would be able to unlock the Great Secret and revive the Universal Religion. 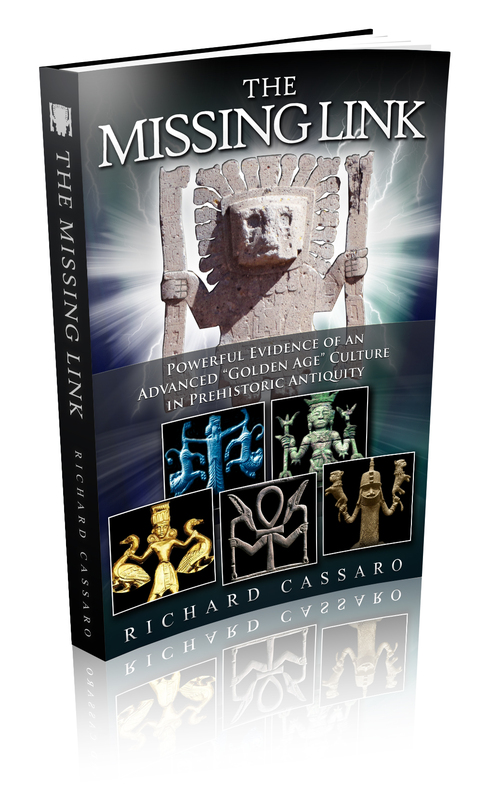 The information here is exciting, new, and groundbreaking: it is, however, merely scratching the surface of what this discovery means and how this discovery could have extraordinary impact and importance for archaeology, history, religion, and spiritualism. The pyramid-building civilizations, and the similarities between them in their religion, art, and architecture, are not non-significant outliers that appeared through convergent evolution; they are, rather, part and parcel of an ancient mystery religion that spanned both time and space. The evidence of this has recently been regained, and this article has presented to you a small piece of it: namely, a brief, very general idea of the religion and its expression in cultures, including the East and the West. 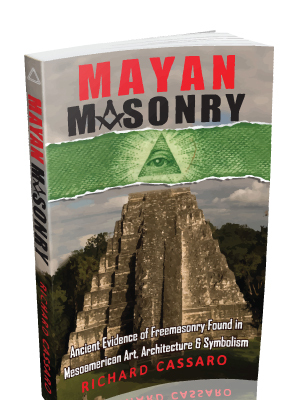 Most notably, we touched upon the idea of the Church’s attempted extermination of the Secret, and the way the Masons subsequently encoded it in the very facades of the cathedrals they built for the Church. There are, of course, many other tie-ins and parallels that could be done with this information, some of which I have done for myself in Written In Stone. In it, I discuss everything touched upon in the article, and expand upon it—including research into the religion’s philosophies, its expression in various different religions across the globe, and its potential origins and paths throughout history, enabling the dissemination of this information across the globe and into cultures as seemingly different as the Mayans and Egyptians. This is, however, merely a drop in this new, unexplored ocean: even with all the research I have put into the subject, there is far, far more work to be done in the field. What is important about this discovery is simply that it has been discovered: for the first time ever in modern history, the lost Universal Religion of the ancients has been reconstructed and is now open to everyone who wishes to study and research it further, whether philosophically, religiously, or historically. 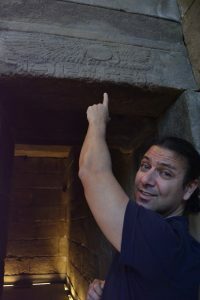 It is in this spirit of adventure that I would like to end this article and thank everyone for reading; go forth and learn about the Universal Religion for yourself in my book Written In Stone. 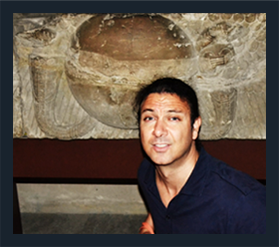 I hope it enriches you and spurs you to look into this discovery more and join me in my quest to uncover the truths lost to history, the facts and evidence that have sunk deep into the mists of time!